The last time Marc-Andre Fleury recorded a shutout (March of last season vs Boston) it was overshadowed by the Cooke/revenge game in Boston. This time it was all about MAF, as he outdueled talented rookie Jhonas Enroth to lead his Pens to a 1-0 victory over the Sabres. Fleury, who wasn't even scheduled to start until Brent Johnson became ill earlier in the day, was sharp all night and made some incredibly clutch saves late in the 2nd and throughout the 3rd to keep the persistent Buffalo offense off the board. The Penguins also struggled, as they usually do against rookie goalies, against Enroth but they did manage to put one up on the board. After a costly turnover straight to the stick of Sidney Crosby, rookie Luke Adams was unable to get back to cover Pascal Dupuis and Dupers buried one after a centering pass from Sid. It helped extend Sid's point streak to 10 games, while his nearest competition's (Vanek had 7) was broken. Fleury was the anchor behind the tough Pens defense as well as their superb penalty kill unit. The Pens were faced with a tough back-to-back PK situation early in the 3rd but Flower would have none of it. Fleury has now statistically recovered from his rough start and is over .500 for the first time this season. Adams' turnover right to Sid which led to the Dupuis goal. Even a rookie should know better than to hand it right to Sidney Crosby. Offense: C+ 1 goal on a rookie goalie isn't really anything to be proud of, but you can't dwell on that after a win. This grade would probably be in the lower C range if they lost. Defense: B+ Didn't give Fleury an easy shutout by any means but their physical play and solid positioning (especially top pairing Letang and Orpik) wore down Buffalo as the game went on. It must also be noted that Michalek probably played his best game in a Pens uniform to date. Fleury: A+ He gets the A+. 30 saves, many of them on quality shots. Can't ask for any more than that. Powerplay: B They didn't look bad, but they just can't seem to finish. Eventually the PP goals will have to start coming, but for now it looks like they are shooting at a dart board rather than a 4x6. Penalty Kill: A The penalty killers (especially Cooke, Talbot, and Adams) have really been the driving force to the team's recent success. Tonight was no different. -As I mentioned before, it was probably Zbynek Michalek's best game of the season. 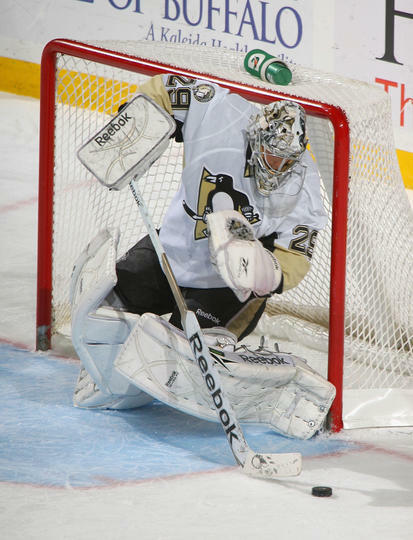 He made a few critical late blocks and was one of Fleury's main assets during the shutout. -Mike Comrie got a chance to play, and it was also probably his best performance of the year. I don't think it will be enough to get his spot back for good (and by right it shouldn't be enough) but at least it's a start. -Another off game for Malkin, but there is a positive we can find in that. Malkin will bounce back soon, and if the team can win like this without him contributing, than imagine how good they will be when he is back on his game.